Stats: Oh My! 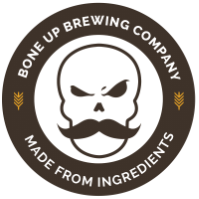 - Bone Up Brewing Co.
Color: A deep dusty orange, edged by hayfield yellow. Cheese Pairing: A hunk of cheddar eaten directly off the blade of a Bowie knife. Food Pairing: Steak (any cut, though ribeye is preferred). Music Pairing (Jared's Choice): "Life During Wartime" by Talking Heads. Best Occasion to Drink: While swappin' stories of the good ol' days. Brewer's Notes: Sometimes you just gotta have an old-school citrus-and-pine IPA, so we took some Classic American Hops and chucked them in the kettle with some Cascade from our friends down the road and mixed in just a *pinch* of Bone Up Magic. We ain't gonna strip the enamel off your teeth, but we are gonna give you a solid beer for solid times. Enjoy.